This post was written by Hanna Johnson. There are many things I like discovering when visiting a new country, and one of these is traditions. In Sicily, I was struck by the celebrations of Santa Rosalia, the main patron of Palermo, and by how people felt devotion for this young lady. If you want to discover what I am talking about, look for an apartment close to city center where the Saint Rosalie’s festival usually takes place. And then you can spend an amazing holiday and get to know more about the local culture. Every 14th July, people from Palermo stop all they are doing to celebrate and honour their beloved patron saint, Rosalia, a girl from a rich and noble family, who refused her privileged conditions and retired at a very young age in a cave on Mount Pellegrino. But why do Palermitani love her so much? Because back in 1624, she save the city of Palermo infested by the plague appearing to a hunter in her cave and telling him to bring back her bones to the city. Credits by Gandolfo Cannatella, Cart of Santa Rosalia in the Cathedral of Palermo. The so-called “Festino”, the big celebration in honour of Saint Rosalia, takes place from 13th to 15th July and it is basically a reinterpretation of that solemn procession, with people carrying the relics of the Saint, called Santuzza, throughout the whole city. For this event, on the very first day of this festival, citizens build a big barge with the statue of the saint covered with a veil in the square in front of the Cathedral. The veil is removed with the beginning of the celebrations, which includes prayers, sermons, masses, hymns and even concerts that gather all the population. 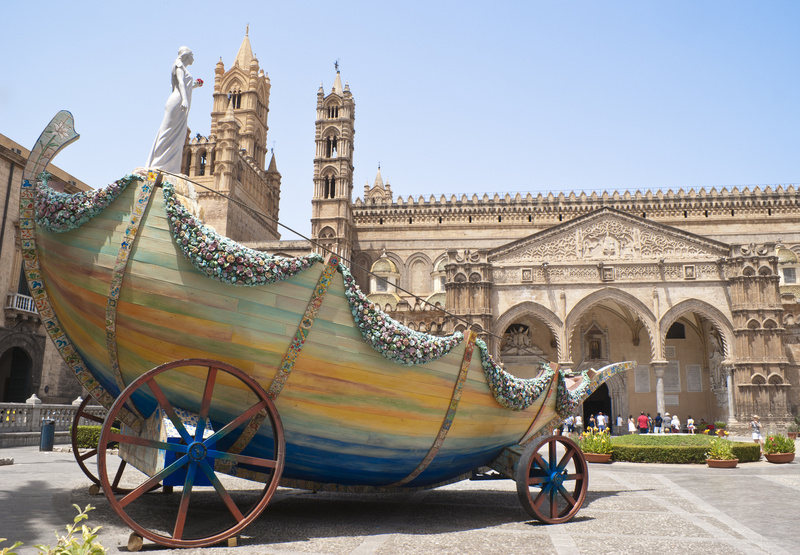 The day after, on 14th July, the barge leaves the square in procession after a mass to thank the saint for the miracle over the plague, and it reaches the Foro Italico and the Quattro Canti, the centre of Palermo. And here the fun begin: when the float reaches the Foro Italico, there are fireworks and singing which will make you shiver. But the Festino is not only about religion. It is a very strong tradition that involves food, shows and exhibitions that every Palermitan simply cannot miss and that attracts tourists from all over the world and other parts of Italy. If you have kids and have the chance to visit Sicily in this time of the year, look for some puppets shows around the city, which will explain children why this Saint is so famous and important for them, and what she did to save their lives through a representations of her acts and miracles. Or if you like music, there will be plenty of concerts and exhibitions in her honour. The festival of Saint Rosalia is not only a religious event, but also a moment of fun and sharing in the Sicilian community. 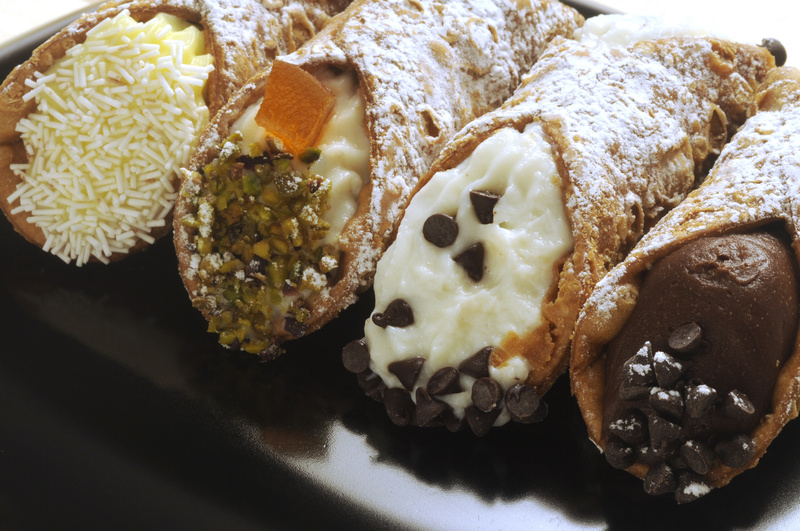 And then food… Sicilian food is too good to be true and during this festival you will have the chance to taste some of the most typical specialties of Palermo. An example? Try “sfincione” at la Marina, a bread dough covered with onions, tomato sauce, anchovies, oregano and caciocavallo, a very tasty and delicious cheese from the South of Italy. Or if you like a dare, ask for “babaluci”, snails cooked in tomato sauce, and eat them like finger foods, while walking through the streets. Sicily is also renowned for its fresh and delicious fruit which is sold in many kiosks and stalls, so do not leave without a slice of watermelon or a taste of fichi d’India. What Did I Spend in 2014 (and other statistics)?